If everything goes according to plan this month, House leaders will round up the necessary Republican votes to pass the chamber’s 2018 farm bill after an unexpected defeat on the floor put the legislation on hold. The failed May 18 vote marked the second time in five years that a farm bill ran into obstacles in the House. In the Senate, meanwhile, leaders have indicated they want to pass the bipartisan legislation by the July Fourth recess. It is too early to tell if the road ahead will be smooth or rocky for the House and Senate Agriculture chairmen and ranking members in negotiating a final compromise bill. Lawmakers in the past boasted about it as bipartisan legislation that took care of low-income people in urban centers and beyond with food stamps, and helped rural communities and farmers whose incomes are at the mercy of the ebb and flow of the market. But recent history shows the difficulty for both parties in navigating the political and regional differences to hash out a new bill that will cost taxpayers nearly $430 billion over five years, according to the Congressional Budget Office. The current law took three years of negotiations before going to President Barack Obama in 2014. There were fights over the Supplemental Nutrition Assistance Program, proposed limits on crop insurance, farm subsidy payments and dairy policy. This year’s House fight over the GOP effort to restructure SNAP, formerly known as food stamps, from a nutrition program into a labor initiative has overshadowed other potential areas of dispute that are likely to emerge, including whether or not big farm operations or extended family members on farms should get government subsidies. What is clear, however, is that lawmakers have two options before Sept. 30, when the current farm bill expires: reach a compromise bill between the two chambers or extend current law through an expected lame-duck session in late fall or into 2019. Both options carry risks in setting policy and funding levels for farm, conservation, nutrition and other programs. In the absence of a new farm bill, agriculture policy would revert to 1938 and 1949 farm bill laws, ending many current farm programs and setting crop and dairy subsidy levels higher than current levels and far above market prices. The threat of permanent law is viewed as an insurance policy against Congress failing to deliver a bill either on time or sometime after Sept. 30. Commodity or farm programs would be affected, with dairy support costs being the first hit after Dec. 31, while the antiquated law would start reshaping crop programs over the coming year. If Congress does nothing at all on the farm bill, crop insurance, which is permanently authorized, would continue. SNAP, which is reauthorized under the farm bill, would continue through appropriations. The food stamp program, which serves more than 40 million people a year, accounts for nearly 80 percent of farm bill spending. However, an extension could be complicated because 39 programs in the farm bill, including ones popular with urban and suburban lawmakers such as organic agriculture and farmers market programs, would lose funding after Sept. 30. If included in an extension, it would take $2.8 billion over five years to save all the expiring programs. Appropriators could decide to save all, several or none of them. During the lengthy effort to produce the 2014 bill, media stories raised the possibility of Congress triggering permanent law and increasing consumer costs on dairy, the first commodity that would be affected. The possibility of outdated laws affecting milk prices even had a name — the dairy cliff. Rep. Frank D. Lucas, who as House Agriculture chairman worked on what became the 2014 farm bill, said appropriators could find money for selected programs if House and Senate leaders make it a priority. In a pinch, Senate Agriculture Chairman Pat Roberts, a Kansas Republican, could turn for help with money to Senate Majority Leader Mitch McConnell, a member of the Agriculture Committee. Lucas, an Oklahoma Republican, said leaders in both chambers might choose an extension of the 2014 law if the House or a House-Senate conference bogs down. If it is necessary to win votes, leaders might ask appropriators for short-term funding for some expiring programs. “When management wants to do something, it doesn’t matter which party, the money appears,” he said. Carl Zulauf, an Ohio State University agriculture economist who has tracked farm bills since 1981, said it’s likely there will be an extension of some kind before there is a new bill. If negotiations stall and the rest of Congress gets caught up in the election year calendar, an extension could last for one year or possibly two years, Zulauf said. That’s because the task of finishing a farm bill cycle would fall to a new Congress with a new speaker of the House or a Democratic majority. Jonathan Coppess, a professor at the University of Illinois at Urbana-Champaign and a former Democratic staffer for the Senate Agriculture Committee, said he will be watching to see how the coalition of farm, conservation and anti-hunger groups holds up. Their collaboration began with the 1973 farm bill after the food stamp program was included in legislation that also covered farm income support programs. The coalition was battered in 2013 during the House fight over SNAP, Coppess said. The farm bill went down on the floor that year after Democrats thought SNAP revisions went too far, and some conservatives voted against it believing the provisions did not go far enough. In response, then-House Majority Leader Eric Cantor, a Virginia Republican, separated the bill into two parts, an agriculture-only and a SNAP-only bill with $40 billion in proposed cuts to the program over 10 years. 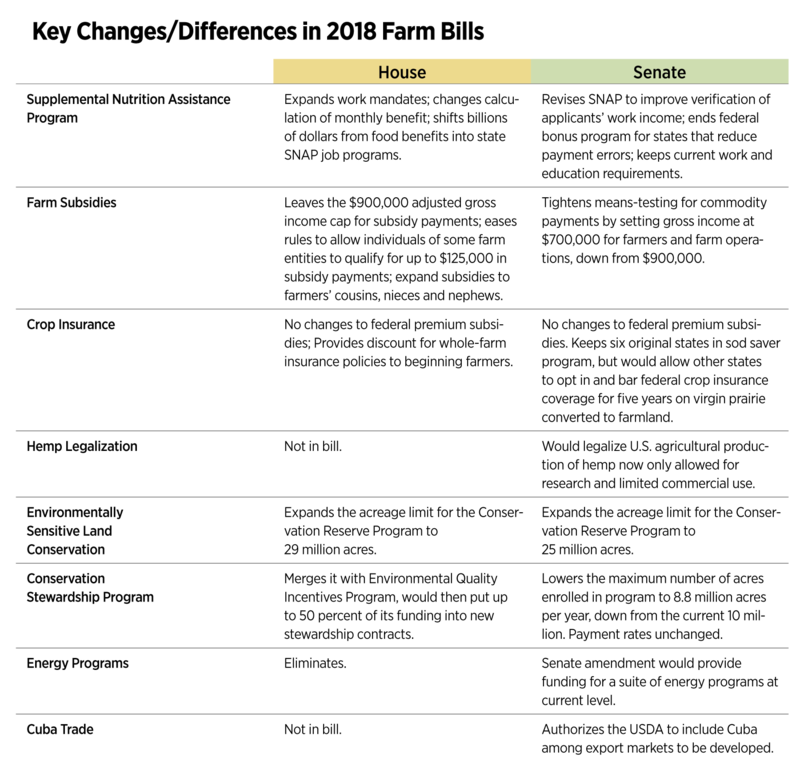 The separate House bills each passed on party-line votes. The agriculture-only bill passed in July 2013, and the nutrition-only bill passed in September 2013. After negotiations with the Senate, the 2014 final bill’s SNAP provisions reduced the scope of the proposed cuts in the House. But on the way to a final bill, negotiations stalled at times over other issues, such as a new dairy program, changes to the cotton program and the end of so-called direct payments based on past crop production that were paid out regardless of economic conditions. The 2018 House bill foundered on the floor after a mix of moderate Republicans and conservative Freedom Caucus members rejected the promise of a vote on a tough GOP border and immigration measure, which was to be scheduled after the House finished with the farm legislation. To underscore their displeasure, many caucus members voted against the bill. House Speaker Paul D. Ryan of Wisconsin then changed his vote from “yes” to “no” in order to file a motion to consider a revote in two days. The House extended the deadline to June 22. Now the bill’s future is contingent on the ability of Ryan and Majority Leader Kevin McCarthy of California to strike a binding deal with the conservative Freedom Caucus and supporters of efforts to override leadership and bring several immigration bills to the House floor. If the Freedom Caucus is satisfied on immigration, Ryan and McCarthy believe enough of the group’s members will vote to send the bill to the Senate. The bill emerged from the House Agriculture Committee on a party-line vote, and getting it over to the Senate is a critical first step for House Agriculture Chairman K. Michael Conaway. The Texas Republican would be placing markers on a number of policy issues when he begins to negotiate with his Senate counterpart, Roberts, and ranking member Debbie Stabenow, a Michigan Democrat. House ranking member Collin C. Peterson, a Minnesota Democrat, will also be part of the “Big Four” conference on the bills. Relations between Peterson and Conaway have been strained since April, when committee Democrats raised concerns over SNAP and accused Conaway of shutting them out of the farm bill process. Things seemed to thaw during floor debate on the farm bill when Peterson joined Conaway to successfully oppose an amendment to revamp the sugar price support program. The proposal by House Education and the Workforce Chairwoman Virginia Foxx, a North Carolina Republican, would have eased Agriculture Department policies that limit domestic production and restricted sugar imports from other countries to reduce competition for U.S. sugar growers and keep market prices farmers and processors receive generally stable. Supporters of Foxx’s amendment argued the government policies raise prices for commercial sugar users such as candy-makers, bakeries and food processors and create a hidden tax for consumers. The proposal went down on a 137-278 vote. Conaway opposed the proposal, saying that if it were successful, opponents of programs for corn, soybeans and cotton would be emboldened. For Peterson, whose district is a top sugar beet producer, the amendment represented a threat to his local economy. Roberts said many Senate Democrats oppose the House bill’s expanded food stamp work mandates that able-bodied adults ages 18 to 59 must meet to keep food benefits, and its tighter eligibility requirements, changes in monthly benefits calculations and the shift of billions of dollars from food benefits into state bureaucracies. As in the House, Senate Democrats argue that supporters of the SNAP provisions overlook the fact that many able-bodied SNAP recipients do work but use the program to feed themselves and their families because they hold low-paying jobs with erratic hours. They say the monthly requirement to prove compliance with the work and job-training mandates will overwhelm state SNAP offices with paperwork and increase the likelihood of people losing food aid because of administrative snafus. Ryan, with his long-standing interest in anti-poverty programs, sees the farm bill as an opportunity to advance GOP welfare overhaul ideas. He argues the provisions showcase the GOP’s belief in the power of work to help the poor become self-sufficient. The bill would increase the amount of savings SNAP beneficiaries can accrue without endangering their benefits and raise the value of a car a SNAP recipient can own to $12,000, in a nod to the need for reliable transportation to work. Where Ryan sees progress, Democrats see money being pumped into bureaucracies that will drown low-income people in red tape, making it easier for states to keep people in need out of SNAP while pushing some current participants out of the program. Stabenow has made it clear to Roberts that Senate Democrats will not support a farm bill with House SNAP provisions. Roberts’ committee approved the bill on June 13, moving it to the Senate floor. And just like in 2013, fights over other issues besides SNAP are possible. — Providing smaller federal underwriting payments to private insurance companies that write and service crop insurance policies. They could even cite the Environmental Working Group, an advocacy group that is critical of the House farm bill and is known for its pioneering databases of subsidy payments. In a recent report, the group found that 27,930 farms received subsidy or disaster payments every year from 1985 through 2016. The group, using USDA data, says the payments total $19 billion. EWG, which opposes the House food stamp provisions, argues that lawmakers should turn their focus to removing language that would expand the number of subsidy recipients and ease payment limits for well-to-do farmers and investors. The organization says the House bill would reward big farms while penalizing the poor who rely on SNAP for food benefits. The group’s report found that the average payment for the 32-year period from 1985 through 2016 was $687,204. The largest recipient, Marsh Farms of Sondheimer, Louisiana, received $11.3 million, and nine others received at least $8 million each, according to the report. Democrats may also object to House bill language that would allow the Environmental Protection Agency to approve pesticides without reviews that are now required to protect endangered species. Environmental groups call the provision an “unprecedented” attack that could have lasting ramifications for ecosystems across the nation. Other targets include House farm bill provisions that expand the number of people eligible for annual payments of no more than $125,000 per person in farm operations enrolled in the Agriculture Risk Coverage, Price Loss Coverage or marketing loans. Married couples would continue to receive a combined $250,000. Under current law, eligibility for farm program subsidies ends for farmers or farm operations with average adjusted gross incomes of $900,000, whether it is farm or off-farm income. The House bill exempts some forms of federal payments from counting toward the $125,000 cap, excludes some types of corporations, including joint ventures, partnerships or other so-called qualified pass-through entities, from payment limits and adjusted gross income restrictions. It also expands the definition of family members eligible for payments to first cousins, nieces and nephews. Sen. Charles E. Grassley, an Iowa Republican and senior Agriculture Committee member, sees those provisions as a hollowing out of what he already considers to be weak payment limits. He has vowed to fight against inclusion of the House provisions in the Senate bill and in the final bill. Grassley was bitterly disappointed when the final 2014 farm bill did not include the more stringent payment limits that he got in the Senate bill and Rep. Jeff Fortenberry, a Nebraska Republican, got in the House version. In mid-May, Grassley tweeted his frustration over provisions in this year’s House bill and concerns that it increased the likelihood of similar easing of payment limits in the upcoming Senate bill.